Well I am back on line with my very own Toshiba 2140CDS Laptop and connected to an OCN server. OCN is the Internet subsidiary of the national telephone company (NTT) here in Japan. They are a little expensive, even by Japanese standards, but I don't have to pay any long distance connect fees with them. Every other service that I looked into would require a long distance charge that is also very expensive. Monthly service is 2800 Yen for 130 hours and then 2 Yen a minute. The Toshiba model 2140CDS is the bottom of the line here in Japan, I don't know if it is sold in the US (can anyone out there tell me and what the price is in $'s?). It has a 450 MHz processor but only 32 MB of memory and a 4.3 MG hard disk. I ordered it from Tokyo so that I could get an English Windows 98 operating system and all the other stuff that comes with Windows i.e. the browser, Outlook Express etc. It seems to be doing the job for me so far. I am having a bit of trouble getting use to the new keyboard and the Acupoint that takes the place of a mouse but it is coming along ok. The set up for the Internet hook-up to the server went much better than I expected. They sent me a very detailed booklet with instruction to set up my computer and provided the user name and password that I needed. Unfortunately, all of this was in Japanese! I had my bike shop owner buddy go through it with me and I also got an English speakers number at OCN. I did the set up as I thought it should be done and then called OCN to confirm the information that I was using and for what purposes. Surprise, surprise! I connected to the server on 16 June, when OCN said it would work, and it worked. Speaking of Japanese language, this may be a good time to bring you up to date on my efforts so far. I have had 8 lessons from a very nice guy that has been doing his very best with me but I am hopeless. I managed to get through the intensive Bulgarian language training with a basic 5 year old speaking ability (not their vocabulary however), but this was 4 hours a day, 5 days a week, 12 weeks and then speaking Bulgarian at home. Here it has been 8 lessons! I have given it up; there is no way I am going to develop any kind of communicative ability with this kind of training. My teacher was very good and helpful but I need the intensive language immersion type training to learn. I can report somewhat more positively in regard to my biking. 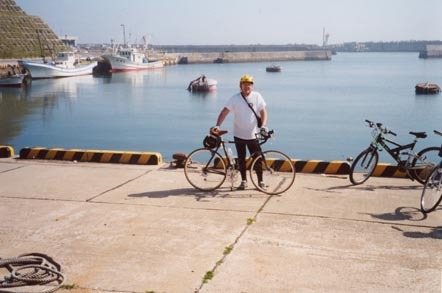 Since I last wrote I have managed to do a couple of 29 Km rides. The first one (22 May) was back to the cave that I had visited before. This time I took my roommate and another Nova teacher with me and we had a very nice day. Got a lot of pictures and had a good ride. I decided to try and find the road that I had missed before so I left my two riding partners and continued north when we started home. As it turned out, I got back into town before they did. I missed a turn once again and the next thing I knew I was about 2 Km from downtown Taira. Rather that turn around I continued on into town to see where I was going to enter the heavy traffic of town and what it was going to be like. It was a very busy road but once again the traffic gave me my right of way and it turned into a good road to ride in on. In the row above from left to right is the north entrance to the cave that contains the Riverbak of Sai. 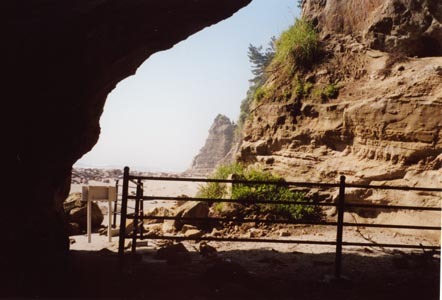 The cave curves through the headlands at Numanouchi and is about a 100 meters long; enough of a curve that you don't see the other entrance from either opening. Just a little spooky! South entrance looking toward Cape Shioyazaki from just inside the cave. 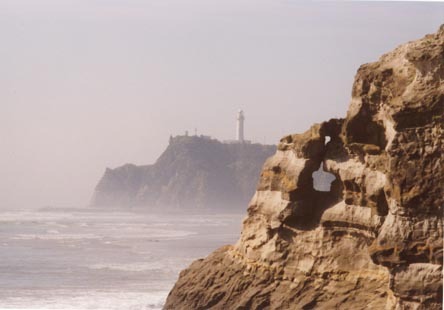 Shioyazaki Lighthouse and Cape with telephoto from near the south entrance to the cave. The Shioyazaki lighthouse was built in 1890 and is one of the symbols of Iwaki-shi. It is 80 meters tall and its light can be seen from 40 km at sea. 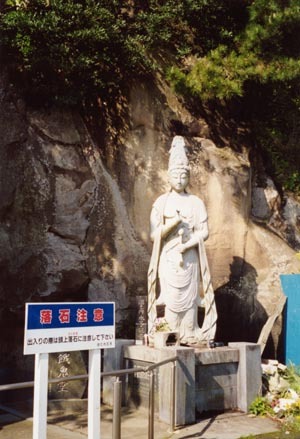 In the second row, on the left is a statue at the north entrance to the cave. 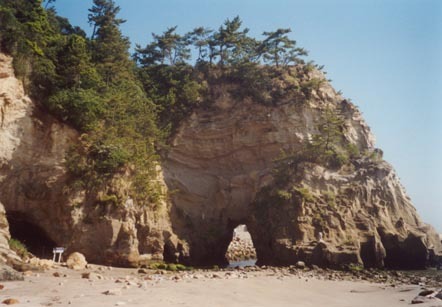 The south entrance to the cave is at the far left of the second picture and the harbor was built just the other side of the sea arch. Fellow Nova teachers that accompanied me on my second trip to the cave. 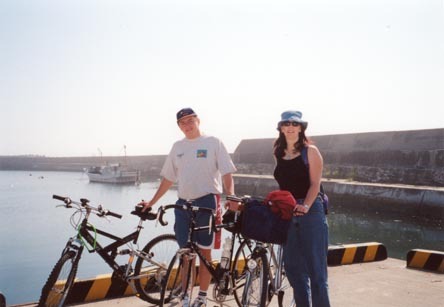 That is David my roommate with his Japanese mountain bike and Laura with her shopping bike . She is holding my trusty steed between them. The harbor is enclosed by the high sea wall that you see behind them and the there is yours truly. The following week (29 May) I went out of town this same way and found the road that I had been looking for. I was being confused with the many highway number changes that happen. On the map there are no highway numbers at all but to follow the road that I was looking at on the map I road 129, 15, and then 35. This took me north until I turned back to the west on 41, again not marked as such on the map, then back south on 399 (this is a major highway that is numbered on my map). It is a good ride with one climb on 41 just before you turn south; the downhill side of the climb was the first road that I have been on that I could turn it loose and fly! Rides have been curtailed since then by weather once again. It is now Rainy Season!